I checked my user profile for this site and discovered that as of today I have been a member for 7 years and 37 weeks. Wow! So much has happened to me and my family over those years and a lot of it was shared on The Oil Drum. For reasons I’ll explain, I haven’t been around much lately. My most recent article was over three years ago. Several religious traditions describe what are termed “hungry ghosts.” These sad beings have insatiable appetites, with tiny mouths and huge stomachs. Modern society creates hungry ghosts among the living. We “have” more than ever, but are constantly bombarded with messages that it is never enough. The poor go to dollar stores, the middle class spend hours at Bed Bath and Beyond, the rich buy ever larger yachts, and city planners are always looking for more land and water in which to expand their urban sphere. Wants have become indistinguishable from needs. I anxiously walk among our nation of hungry ghosts, asking myself what these addicts will do when they can’t get their fix? What many of us found at The Oil Drum was a place to share our anxieties with those who share our anxieties. I am not being dismissive of this at all! Many here have points of view that place us outside of conventional wisdom, and this can be socially difficult. Where else can we go to have conversations that may be impolite, misunderstood and dismissed by the hungry ghosts we live among? Many of my articles framed topics from an Ecological Economics perspective, where the economy is a subsidiary of the planet and functions by extracting resources and depositing wastes. Essential resources like energy, mineral ores, food and fiber can only be easily ignored when they are inexpensive to buy and reliably available. Many of us are alarmed because we see existential threats to the bottom of a top heavy pyramid and would like those situated higher up to pay attention and look below. The U.S. Food System consumes several fossil fuel calories for each food calorie eaten. The typical grocery store has about three days supply of goods on its shelves. Each U.S. farmer (plus machines with fuel) feeds 100 people. Two additional posts, “Save it for the Combine” and “Energy Descent and Agricultural Population” perhaps best capture the sense of the transformative change fossil fuels made in agricultural production and labor inputs, and offer some perspectives on adaptation to lower fossil fuel availability. Figure 3. 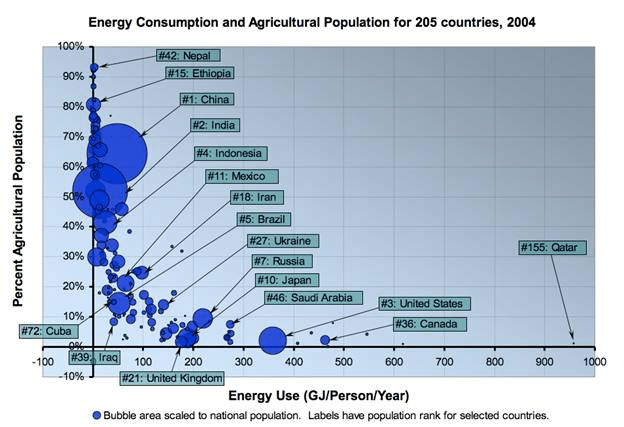 The percent agriculture population is plotted in relation to per capita energy use. Nations with abundant use of exosomatic energy tend to have less of their population involved in agricultural production, presumably either because they can afford to import much of their food or employ labor saving devices in food production. For example, only about 1% of the US labor force is involved in farming. Data comes from the Energy Information Administration (EIA) and the United Nations Food and Agricultural Organization (FAO). Original article containing figure is here. The Campfire series was not only about exploring heterodox ideas, it was also meant to be a place where practical advice was shared. Many of us wanted to go beyond the talking stage and “do something” about the information and analyses presented on the site. This brings me to why I haven’t been writing here lately. I went to the 2008 ASPO meetings in Sacramento not only to learn, but to network and hopefully meet someone who could help me with something. I wanted to farm at a significant scale to practice and demonstrate a form of agriculture that needs much fewer external inputs and is thus adaptive to our times. I met my eventual business partner (and TOD member) Craig Wichner in Sacramento. We were able to introduce our company, Farmland LP, at ASPO 2009 in Denver, where I gave two talks that eventually became posts (here and here). Over the past four years Craig and I have taken a heterodox idea and turned it into something substantial: Farmland LP currently owns and manages 6300 acres of cropland in California and Oregon. So, I’ve been pretty busy. I am still writing on my company website but most of my posts are news related to the business. On occasion I do develop articles that look at the big picture and do in-depth analyses, such as “ The Many Benefits of Multi-Year Crop Rotations” and “Google Earth, Rotational Grazing and Mineralization, Part 1 and Part 2” but I won’t have time for more of that sort of writing until we are done with planting this fall. This brings me to the end of my last Campfire post. In customary fashion I will pose some questions and ask readers to share their experience, wisdom, frustrations, and final thoughts for The Oil Drum. So I was delighted to get a call the other morning. Over the hum of a motor Clint told me, “Hey Jason, I’m harvesting the field north of our office today if you want to visit.” Heck yeah! And I could bring the whole family. It was Saturday and we all would get a turn in the cab. 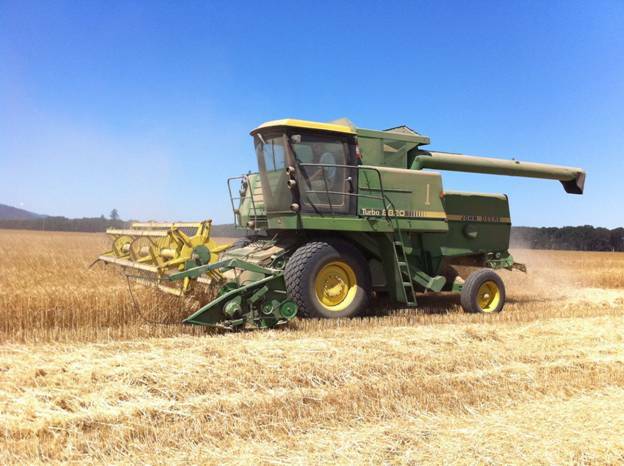 It is the middle of August and time to harvest wheat in the Willamette Valley of Oregon. Clint lets my 11 year old son Curtis steer a John Deere combine. Clint says newer equipment is faster, but more difficult to repair, so they stick with this model from the late 1980s. Being aware of peak oil for several years now has given me time to consider what energy dense liquid fuels are extremely useful for. In an energy scarce world we will be resetting priorities. The question for the future is what do we need to do with energy rather than what do we want to do with energy. In this post I will nominate my top pick. If I could wave a magic wand and reserve ample future supplies of petroleum (or some precious substitute such as a biofuel with high net energy) for just one use it would be the combine. The percent agriculture population is plotted in relation to per capita energy use. Nations with abundant use of exosomatic energy tend to have less of their population involved in agricultural production, presumably either because they can afford to import much of their food or employ labor saving devices in food production. For example, only about 1% of the US labor force is involved in farming. Data comes from the Energy Information Administration (EIA) and the United Nations Food and Agricultural Organization (FAO). Original article containing figure is here. 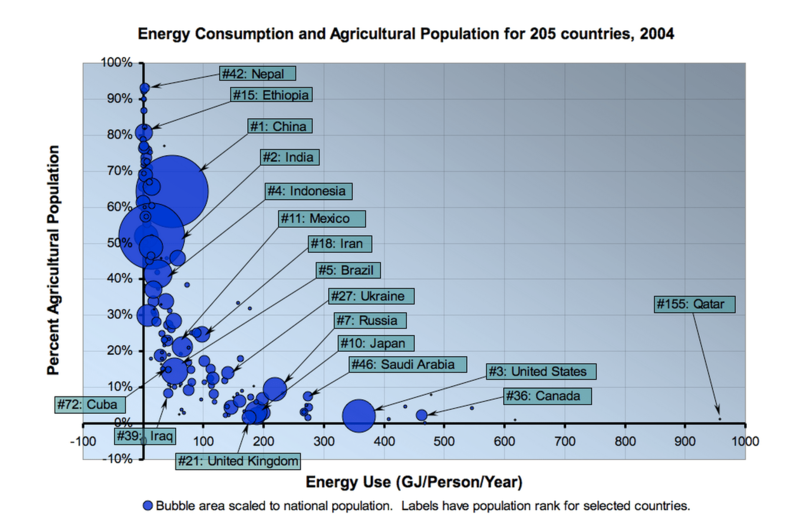 Looking at the above figure, it seems plausible that in the US we could do away with ¾ of our per capita energy and, if we allocate smartly, keep the combines running and continue to feed everybody with little extra labor (and assuming climate change doesn’t bite too sharply into yields). I do have mixed feelings about how the historical shift into cities and away from farms has impacted our culture. On the one hand, surplus food has permitted our society to specialize greatly, developing technologies, arts and forms of entertainment that I truly enjoy. Material abundance may also have led to cultural openness and flexibility, or what may be called liberalism, as opposed to the rigidity, isolation and xenophobia common to many pre-industrial societies. Obviously, combines are entirely reliant on barrels and barrels of liquid fuel. Clint told me he uses about 50 gallons of fuel for every 8-9 hours harvesting wheat, which would cover about 17 acres. This means it takes around three gallons of diesel fuel per acre, just for the harvest. In standard energy terms three gallons of diesel contains 0.44 Giga Joules (GJ). For comparison, 2400 lbs of wheat contains just over 15 GJ of edible energy. Ignoring all the other energy needed to deliver the fuel to the farm, and get the crop to maturity, the harvest-only EROI is a highly profitable 34:1. 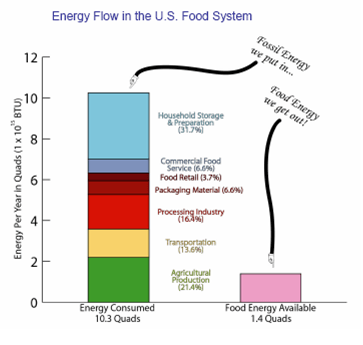 (For a more thorough review of energy in the US food system see this post). 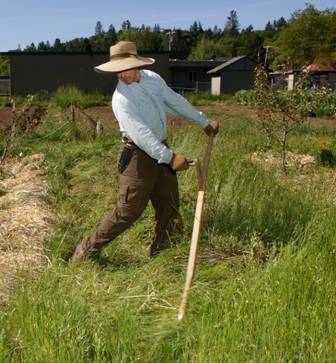 This is a picture of me scything grass between young orchard trees. I enjoy using the scythe and believe it is a valuable tool even on highly mechanized farms. I just wouldn’t want to rely on it to harvest food for dozens of families. If we ever need scythes again to cut down our grain crops then most families will be feeding themselves. We tend to settle into routines. But once in a while extraordinary events disrupt normalcy. We may question assumptions and be open to new information and change. A grief process is common in these times too. The accident in the Gulf of Mexico is a disruptive event. Here’s an essay that puts it into personal perspective for me. In the comments I invite others to do the same. I have some good friends in Louisiana. They took their children to the beach last weekend over concern that this may be the last time they would find clean sand in their lifetimes. For the adults, watching shore birds and dolphins was both thrilling and sickening. Humans can imagine a future that does not yet exist. This can be a blessing and a curse. It is a curse when events spin out of your control and you fear the loss of something precious. It is a blessing when you can plan ahead and change the future by your actions. Yesterday I walked on our farm and envisioned what it might look like 1, 3, 5 and 20 years from now. It was beautiful. My imagination is assisted by the stunning places there now, such as the big leaf maple and ash forest on the western edge of the north field near the Marys River. In early May, this forest has an enchanting understory of purple larkspur and cow parsnip–one of the best displays many experienced people have ever seen. Sometimes I think about (or even witness) the spores of saprophytic fungi that colonize the farm fields and speed the breakdown of organic matter so plants can grow. When I see mounds from ground rodents near the forest edge I smile because I know they bring mycorrhizal spores into ag soils, which dramatically increases the water efficiency of plants and the uptake of often limiting nutrients like phosphorus. Knowing the forest is rich in microhabitats and teaming with critters, I am thrilled by a nearby source of pollinators, ground beetles, spiders, bats and predatory wasps that will make their homes in the shelter of those trees and leaf litter and come onto the fields to do their feeding. What do I envision for this farm? A lot, but one line of thought is that it more of it will look like this forest. The banks of the river will be protected so species such as chinook salmon, cut throat trout, spring steelhead, Oregon chub and Pacific lamphrey (all rare and threatened) have a better chance to thrive. In developing more riparian forest it is easy to see how this will protect the fish. But my mind sees deeper connections that extend back to my friends in Louisiana. You see, my goal is to have this farm weaned from fossil fuel dependency so that we don’t feel the pressure, as a society, to go after oil in far flung places so we can grow our food. Here’s how it goes…The forest harbors larkspurs. Larkspurs feed hummingbirds. Hummingbirds also eat crop munching insects. Thus, in the long run, through many, many synergies like this, the farm will become less and less dependent on oil-based inputs like pesticides. Here are some discussion topics for Campfire. I am a biologist who can see many, many ways in which our current ways of doing things are unnecessarily dependent upon oil. I also see how the energy gluttony of fossil fuels allowed us to forget about so many important relationships because we had available both the awesome power make huge mistakes and to compensate for them. It would be interesting to hear from others along these lines. What are some of the ways you see to ‘get off the sauce’ so to speak that are often unseen by others? As I have learned more and more about energy, economy and society I see connections to oil and fossil fuels everywhere, as in this one on “Oil and Larkspur” that weren’t obvious before. What surprising connections have you made from the profound to the mundane? The Wendell Berry poem acknowledges grief and explores a means of coping. Feel free to share the ways you deal with these issues. I want to discuss the notion of “healthy addictions.” Really, this is an important topic. Our brain likes ‘happy’ chemicals and we tend to find ways to effect their release. Trouble is, we become quickly habituated to stimulation and then seek novelty in order to get that same old feeling. Our modern society gives us so many opportunities to be rewarded, but many people can’t handle it. They gradually become addicted to unhealthy things. Topics I’ll explore are: Distinguishing between healthy and unhealthy addictions. Examples of each kind. And my birthday wishes. Nate Hagens has written about the psychology, sociology and neurology behind addictive behavior, including consumerism, which is basically the process of turning high value natural capital into mostly disposable products with low or often negative marginal utility. Over a year ago Nate and I did a radio show together titled Evolution, Addiction and Economic Demand. Go there for more background or check out this one from The Oil Drum archives. The bottom line is that I don’t believe we can keep from becoming addicted to something. Once we accept this fact of life, the issue becomes whether we can work on controlling what we are addicted to–making it healthy and inexpensive rather than destructive and costly. This table contrasts healthy and unhealthy addictions using four criteria that I think are important. Consider what you do regularly as a kind of pleasurable compulsion and compare it to that table. Is it an activity that consumes a lot of resources and generates trash, or is it environmentally benign? Do you get tired of it quickly and feel pressure for “more”, or does the pleasure linger? Is it causing you to be pulled always into the present and unable to plan for the future, or does it involve delayed gratification? Are you depleted mentally or physically by the activity, or are you stronger or more skilled as a result? I believe cultivation of plants is a healthy addiction. When I am working on the farm or garden I get to do all sorts of addictive activities. First, I make plans. This sets up the expectation of a reward. But the reward is in the future and the exact timing and quality of the reward is not perfectly known. This is important from a neurological perspective. We want to have expectations fulfilled, but they can’t be totally predictable because fulfillment requires the establishment of tension. After the garden plan sets up a potential reward, I invest in its outcome. This raises the stakes. I really don’t want the plants to die. I tend them. Watching them grow feeds mini rewards. “Oh look! The seeds are germinating!” Getting the odd positive reinforcement along the way keeps me hooked. It’s like having a flirtatious conversation. I really don’t know why, but the plants are beautiful too. I like to gaze upon a thriving bed of rainbow-colored chard. The colors of lettuce are astounding, especially when back lit during dawn or dusk. I grow a light green variety called Salad Bowl and a dark red one called Red Oak Leaf. Seeing them side-by-side is a treat. I look forward to these experiences each year. In the winter I start to miss them. Seasonality is crucial because it re-establishes novelty. I don’t eat fresh tomatoes out of season, which means I enjoy them all the more when they come off those vines. And the winter provides its own rewards. Tree collards are sweetest in the winter, for example. The occasional snow or hard frost events are fun. An inch of snow on dark green-blue Dino kale is a more or less twice-yearly spectacle. Looking at the four criteria, growing my own organic food is a great addiction. It has a low ecological footprint as I use mostly manual labor and local resources, and it displaces potentially purchased food with a high footprint. Habituation is slow because the novelty begins anew each year. The required planning and delayed gratification related to “plant time” helps me develop a long-term perspective, or a relatively flat discount rate. And I am eating nutritious food and getting plenty of fresh air and exercise. For comparison, let’s briefly review the great American pastime of shopping. Product developers and marketers exist to get us addicted to buying stuff. I notice that people give each other things because they feel obligated or as a sign of affection. (Personally, I can’t guarantee I won’t snap when my kids are given more plastic gizmos and candy at the next round of holiday festivities). Shopping addiction qualifies as unhealthy: the embodied energy and resulting pollution are high, product novelty wears off quickly, advertiser promotion of “newness” increases short-term thinking, and having too much stuff means that the marginal utility for most things is low. Think about it. If consumer confidence goes up people will eat out more, buy more party food, and probably gain weight and clogged arteries. We will then get a new report on the worsening epidemics of obesity and childhood diabetes. My last birthday wish is for more people to start connecting a few simple dots. There must be a whole lot of healthy addictions out there. I expect that as people have less money and more time they will shift into new kinds of activities, and I hope these outlets are good ones. We are a remarkably species, able to adapt and acclimate to great changes. Discussion question for readers: What healthy addictions have you developed, and what unhealthy ones may have been replaced? The following is the prepared text for a talk I gave in the city hall of Eugene Oregon the evening of Feb. 17, 2010. It was organized by two Lane County commissioners and the city mayor and is part of a series on Food Security. My role was to discuss food security in the context of peak oil. This speech is similar to one I gave last year that was also posted on The Oil Drum. At the end I recommended people look up The Post Carbon Institute and affiliates for good leads on what ideas and actions are happening in response to our predicament. My presentation has 4 parts. First, I will connect what is going on in the economy right now with natural resources and the environment. Second, I will explain why oil is an especially important resource and what is meant by peak oil. Third, I will discuss the implications of economic decline and peak oil for the food system. And fourth, I will suggest what families and society can do given our predicament. Several generations ago our forefathers walk into “Bank of Nature” and get a loan. Mother Nature approves our loan and offers us plenty of credit. Our ancestors are now endowed with the riches of ancient forests, prolific fisheries, fertile topsoil, clean water, concentrated mineral ores, vast reserves of fossil fuels, and a splendidly stable climate. These assets, Mother Nature’s credit slip, are the source of our wealth and comfort. Every widget, gizmo, thing-a-majig, do-dad, wach-a-macall-it and Winnebago produced in our factories, sold in our stores, stuffed in our closets, piled in our landfills and spilled in our waters originated as a loan from Bank of Nature. Why are we having economic troubles? Because loans, as we are now discovering, are not just slips of credit, they also come with debt. While we gleefully liquidated the Natural Capital loan Mother Nature approved for us, we failed to develop a business plan that could pay back the debt. This ecological debt is the underlying drag on our financial system. What this means, practically, is that as soon as the economy tries to heat up again, which we like to call increasing DEMAND, it will be capped on the knees by the henchmen Mother Nature hired. She will not extend us any more credit since we have done a poor job with the first loan. If you are unclear about what I mean here, I’ll explain this a bit more when I talk specifically about oil. I have seen pictures of some great protest signs over the past couple of years that state this very succinctly: Nature doesn’t do bailouts. This is why the current policy of all central banks and governments to deal with the financial crisis, which is to essentially create and inject more money into the system, has no chance of success. More money doesn’t solve an ecological debt crisis, because money is a claim on resources and not worth anything by itself. Okay, now I want to highlight the special role of oil in our economy. Over the recent decades, we have built what is called a “globalized economy” where materials, labor and services are readily exchanged across the globe. This feat has only been possible due to cheap oil. The “cheapness” is key. Transportation costs are assumed to be only a small part of doing business. Some economists have calculated what is called the Goldilocks Zone for oil prices. Below $70 per barrel and it makes no sense for oil companies to explore and develop new supplies, while prices above $80 per barrel lead to a curtailing of demand, basically cutting off prospects for U.S. economic growth. And as mature oil fields deplete, the price to explore and develop new oil wells goes higher than $70 per barrel, essentially locking the U.S. into economic stagnation. Step back for a moment and think about how potent and special oil is. Oil is highly energy dense and easily portable. A gallon of oil contains enough energy to do the work of hundreds of people simultaneously or a single person for hundreds of hours. You can drive a 4000 lb car at great velocity for tens of miles on a gallon of gasoline. Try pushing a car that distance (but before doing so, ask your doctor if that’s okay). So when you hear the term peak oil, what does that mean? Peak oil is simply the point in time when the global supply of oil stops growing. Peak oil is not a theory, but an historic fact for 2/3 of oil producing countries, including the United States, which peaked in 1970. What we experience is less supply leading to a spike in prices. High oil prices then choke off economic growth because our globalized economy is structurally reliant on cheap oil. And without economic growth loans are not paid back sufficiently and a financial crisis ensues. This is essentially what happened between 2005 and 2008. We had a credit bubble because of lax lending policies PLUS a flattening of oil production at the same time. Okay, so what does this have to do with food security? Globalization and cheap energy led to the development of centralized processing and distribution channels, with what is termed “just in time delivery systems.” The typical grocery store, for example, only has a 3 day supply of food on the shelves, and relies on daily trucking from distance warehouses to restock basic supplies. An oil supply shock would disrupt getting food to stores. Because of cheap and reliable transportation, it has been possible for entire agricultural regions to become highly specialized in production for export. So the Willamette Valley evolved into a grass seed capital, which replaced a diversified farm economy that contributed significantly to local consumption. Since we no longer have the local farms feeding us, we depend on global trade for basic sustenance. Farming methods themselves rely on cheap energy, such as tractor fuel and imported fertilizers. Beyond the farm energy is used extensively in processing, distribution, storage and cooking. All told, about 7 calories of fossil fuel go into each calorie of food we eat. Modern farming is highly connected to the financial system. A depressed economy makes credit scare. Many farms that are in debt and require bank credit to operate will likely go out of business. And some financing is going to be needed to help farms restructure for the transition towards new crops, new methods, and new markets. I’ll first address this towards individual persons and families. As energy flows to society decline, our social systems will become less complex structurally, but our daily lives more complex. What I mean by this is that we will become less of “specialized cogs in a big machine” and instead have to take on more diverse, practical, and flexible roles. The kinds of work we do will shift too. Consider whether you specialize in a “nice to have job” or a “need to have job”. Jobs are going to be more and more about securing basic needs, such as food, water, shelter, health, and security. Fewer paid jobs will be available. This will require people to rely more on the informal economy, which means getting paid through reciprocal exchange relationships. Start by getting to know your neighbors, joining social networks, and developing a few basic skills, such as gardening, bike repair, and inexpensive health care. As our formal economy declines more work will be done in the informal economy, as is true now in so-called developing countries. 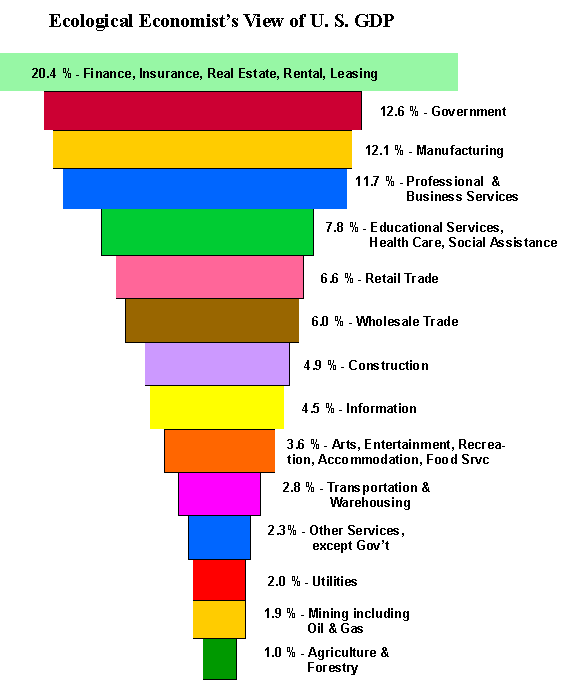 Graph from Post Peak Living based on World Bank data. This all may sound extreme, but it is already the reality for a growing subpopulation of tens of millions of Americans, and most of the 6.7 billion humans on the planet. Now I’ll talk about what I’d like to see society do. Instead of thinking about policies and programs, I will talk about values and paradigms. Primarily we need to recognize that the environment is our primary form of wealth. Bank of Nature, not Goldman Sachs or the Federal Reserve, is our master. It is far more important for us to pay back our ecological debts since these are non-negotiable, whereas financial ones are among people and can be forgiven. If you manage public funds, always ask whether allocating money is going to rebuild natural capital or further its liquidation. I’d like to see community leaders ask people to consider themselves as contributors rather than consumers. The whole consumer identity should become passé. We will thrive by creating an ecological identity, which is a deep appreciation for our relatedness and absolute interdependence with other people, other forms of life on this planet, and the fundamental forces of sunshine and geology. What I have said may provoke anxiety, and is certainly an immense undertaking, but ultimately we have no choice so let’s not whine and delay. Let’s take it on as a great adventure, a thrilling challenge. Our success or failure is going to hinge on our attitude. We need to take control of the circumstances and become active participants in transition. I can assure you that doing so is tremendously energizing, healthy, and rewarding in so many ways. Note: This is my second post based on a portion of my presentations at the recent Association for the Study of Peak Oil conference in Denver. The first post is here. Go to the ASPO web site for the complete slide deck. Readers may also appreciate this article by Stoneleigh for more theoretical background. Ecosystem resilience is the capacity of an ecosystem to tolerate disturbance without collapsing into a qualitatively different state that is controlled by a different set of processes. A resilient ecosystem can withstand shocks and rebuild itself when necessary. For something as critical as food, it is common sense that society should design for resilience. Reliability in food production in the face of change requires a system capable of rapid evolution. Resilience is therefore a core principle of sustainability. Unfortunately, our daily bread relies on a food system that is not resilient. As I have explained before, this state of affairs is an outcome of government policies, financial pressures, cheap fossil fuels, and market forces in play over the past several decades. The result is a food system dominated by relatively few large actors, which creates conditions of rigidity and brittleness. Resilence is a concept from the science of ecology. Ecologists study what are called food webs, which are feeding relationships among populations. A simple food web might be a plant eaten by a browsing animal, which is eaten by predator. When animals die a scavenger eats those bodies. And the poop is eaten by microbes that make the nutrients available to the plants again. Diagram of a simple food web with lines indicated feeding relationships among populations of plants, herbivores and carnivores. A low diversity food web has strong connectivity between parts. Therefore, the loss of one part (as shown by the red cross mark through the herbivore) has big effects on other parts of the food web. Ecologists have found some important relationships between food web structures and their properties. When food webs are very simple, meaning they have few parts that are connected to each other in straightforward ways, the system often shows unstable dynamics, such as widely fluctuating population sizes. It is easy to see how this happens. If a predator is dependent upon one prey, a decline in that prey will starve the predators. An early and classic study of a low diversity food web. With only a few, strong connections, volatile dynamics result. By contrast, diverse food webs have many parts, and often the relationships among parts are weak and not so simple. For example, instead of a few plant species there are many, and there are several herbivores that have a choice of feeding on different plants. The same is true all the way up the food chain, with predators being able to feed on a variety of prey. More diverse systems are more stable because if any particular plant or animal population goes into decline, feeding relationships are plastic and can adjust so that the loss of one part doesn’t cause havoc with others. High diversity food webs have weaker connectivity among parts and therefore built in redundancy. This permits parts to adjust to losses, effectively buffering against volatility. Farms in the U.S. have become highly specialized to produce a narrow range of products. In the Midwest, for example, corn and soy dominate. In the Willamette Valley of Oregon, grass seed is king. In 2009, 71% of U.S. cropland consisted of just three species (source USDA). Low diversity at the farm level is magnified by low diversity all along the input and supply chains. Because of consolidation, few seed companies remain. And when it comes to getting paid after harvest, there are fewer buyers for farm commodities, and fewer distributors and retailers too. Few parts with strong connections among them preconditions the system for high volatility. Seed industry consolidation 1996-2008 from Phil Howard of Michigan State University. Reaction to this issue via antitrust litigation is now occurring. The fundamental emergent properties and core functions of a resilient system remain stable even as rapid change is occurring, whether from external forces or the ebb and flow of individuals and populations that make up an ecosystem. For the food system this means being able to produce, store and distribute food even when critical conditions alter dramatically, such as a credit crisis, energy shortfalls, or extremes in weather. Cheap transportation fuels have obviously been key in the development of our current food system, which emphasizes producing crops with high regional comparative advantages in yields, labor, or mechanization, and exporting them. If we foresee a future with continued and possibly greater economic, resource and environmental volatility, then reconfiguring the food system for resilience is a smart strategy. Principles for doing so can be found by studying the structure of ecosystems. Natural systems are inherently resilient but just as their capacity to cope with disturbance can be degraded, so can it be enhanced. The key to resilience in social-ecological systems is diversity. Biodiversity plays a crucial role by providing functional redundancy. For example, in a grassland ecosystem, several different species will commonly perform nitrogen fixation, but each species may respond differently to climatic events, thus ensuring that even though some species may be lost, the process of nitrogen fixation within the grassland ecosystem will continue. A resilient farm has diversified operations to buffer against volatility. The benefits of diversity accrue in many ways. Organic and especially agroecological farms are less dependent upon outside inputs that can change in price rapidly and unpredictably. Crop rotation plans include many species of plants and animals that are complementary in functions, such as legumes fixing nitrogen, grasses building soil carbon, and animal manures making nutrients more readily available to plants. Instead of buying mechanized services or fertility inputs, the farm integrates the functional diversity of life to create synergies. A farm layout and field rotation pattern based on agroecological principles. Colors represent different classes of production: green is pasture, brown is legumes, yellow is grains, red is cover crop, and blue is other seed crop. Each image shows a different year of land-use. Inherent diversity means no single crop failure will ruin the farm, and soil imbalances are prevented. The focus is on soil health, with all fields going through periods of planting in perennial and deeply rooted species to build soil organic matter and mobilize minerals such as phosphorus from deep layers. Fungi associating with roots locate source rock and solubilize minerals that are trans-located to leaves. Topsoil fertility is therefore built from below. Plant breeder Wes Jackson of the Land Institute (right) compares the root system of wheat (left) with that of a perennial wheat under development (right). Landscape structure is created to provide habitat for native and naturalized species that participate positively in the farm food web, such as pollinators and predators. No need to buy pesticides when raptors have homes in the trees, predatory wasps have nectar sources, frogs can breed in clean water, and ground beetles have zones of refuge from tillage, for example. While the emphasis is on letting the biology do the work, renewable energy infrastructure also creates resilience. Farms are often ideal places for wind and solar technologies, and on-farm biofuels are likely to have positive energy returns. The many differences between conventional and sustainable farming systems are compared. Most farms in the U.S. operate for purposes of exchange, not self-reliance. A resilient farm therefore needs to consider how it connects to the rest of the economy. Do farms have few or multiple choices in the sources of seeds, fertilizers and other inputs? Do these inputs come from far away mines and seed companies, or from local businesses? Are farmers beholden to a dominant buyer or do many potential buyers exist for their products? To have a resilient food system the associative farm economy needs diversity too. Since this is typically not the case anymore, transforming the food system, both on and off farm, takes time, coordination among actors, patient financial investment, and the ability to adapt. Different economic arrangements are competitive at different periods of history. I believe we are entering a time when the diminishing returns on previous investments will open up opportunities for new actors. Because of economic volatility, what works going forward will be different than what worked in the past. This is an age of great innovation where agroecological farming and local food system development will emerge as a natural and smart response to pressures of resource depletion, protection and enhancement of natural capital, and financial and job insecurity. What will this new food system look like? It will be organized akin to an ecosystem, or food web. Farms and renewable energy infrastructure occupy the level of primary producers, with businesses acting as conduits for feeding omnivorous humans. In contrast to our current food system, which is linear in structure, the future food system will cycle nutrients back to the farm. This structural constraint will mean that much more food is grown for local populations. Nutrients will still leak from landscapes, and so maintaining long-term fertility will require replacing what is lost. In forests of the Pacific Northwest, salmon migrations brought the mineral wealth of the ocean back to the land. Restoring migratory fish habitat therefore aligns with the needs of agriculture. Harvesting of kelp deposits on beaches and salt deposits from tidal zones and transporting them inland is another viable means of supporting the mineral richness in soils. Bernie Winters of Clare Island, Ireland, harvests kelp from rocky beaches to remineralize the soils on his farm. I hope this post has clearly framed the issue of food system resilience and the general principles involved. Many examples exist that align with the goals of resilience, including novel distribution systems, farmer training programs, and specialists on soil restoration. Please share other examples you know of, and discuss aspects of the challenges involved in more detail. Note: This post is based on a portion of my presentations at the recent Association for the Study of Peak Oil conference in Denver. Go to the ASPO web site for the complete slide deck. And thanks to Debbie Cook for inviting me to be on her panel. Sachs said agriculture is the leading source of greenhouse gas emissions, and he also linked the industry to depletion of water supplies and fisheries and poor dietary habits. What I’d like to do for this post is ask if government policies contribute to the troubles in the food system. I see ways in which we are we working against our own interests, akin to a giant tug of war game, where the work of one only serves to counter the work of another. Once we identify the policies that support current conditions, we can readily suggest adjustments that will align with broad measures of well being. I also want to acknowledge that part of the reason we produce food the way we do is because it has been incredibly successful at yielding abundantly and at low initial costs. What is more troubling are the unintended consequences that Prof. Sachs identified and that I will discuss further. These are the long-term costs, or externalities, that need to be factored into the transition towards sustainability in food production. I identify four social goals that most everybody can agree on: Environmental Protection, Healthy and Safe Food, Economic Vitality, and Peace and Security. Many of us may be familiar with the environmental woes of agriculture, such as soil erosion, hazardous chemical runoff, and their impacts on air and water quality. Also, many people are waking up to the fact that our food supply is generally unhealthy and sometimes unsafe. Fewer people realize that from a monetary perspective, the U.S. is importing much of its food. We tend to export cheap commodities and import expensive fresh and processed foods. There are two ways to improve a trade balance: export more or import less. Our national balance of trade would improve and regional economies would revive if we focused more on replacing high value imports with local goods. An unintended consequence of subsidizing the over-production of certain crops, like corn, is that global prices were lowered to the point that farmers in poor nations were driven out of business. This has tremendous implications for global peace and security as nations with weak trade and financial power lose food sovereignty. Perhaps the easiest way to explain the conflicts between broad social goals and food policy is by explaining the feedlot system. A typical meat or dairy feedlot does not place cows on pasture, but in pens where food is delivered in the form of hay and feed made primarily from corn and soy. Feedlots have tended to develop in regions far away from population centers where land costs are low and environmental regulations are weak. For example, in the U.S., some of the newest and largest dairy feedlots are in eastern New Mexico and western Texas. Some local hay is grown using center pivot irrigation by pumping fossil water using fossil fuels, but most feed is trucked in from more fertile regions. And the animals in these operations are given antibiotics to keep disease from spreading in the confined and unsanitary conditions. Of course a lot of energy goes into keeping the milk cold for the long distance it needs to go to reach store shelves. These feedlots are only possible because a specific set of conditions exist: 1. Cheap energy (especially oil) allows food to be transported around the world, 2. Environmental regulations are ignored or under-enforced, and 3. Crop subsidies make feed (especially corn and soy) ridiculously cheap. Much of the energy needed to support the current food system is liquid-fuel based, and the U.S. now imports 2/3 of its oil consumption. I am not going to delve into the details here, but given that domestic oil production peaked in 1970 and is now down by about half, this is not a situation that can be reversed by more drilling or exploitation of unconventional reserves like tar sands or shale oil. Suffice it to say that the era of cheap oil is behind us in the U.S., and the food system will need to adapt. The U.S. has many great laws aimed at protecting public health and the environment, but enforcement is often tricky. A prime example is the feedlot industry, which has developed in poor rural areas in need of jobs and with relatively weak government oversight. Even when facilities are cited for hundreds of violations, it can be difficult to shut them down. The public backlash is growing stronger, however, and one wonders when this whole business model will be untenable. Let’s look at crop subsidies. Between 2003 and 2005, about half of all U.S. crop subsidies went just to corn, or about $17 billion. This is one reason why so much corn is grown in the U.S.–over a quarter of all cropland for just this species. 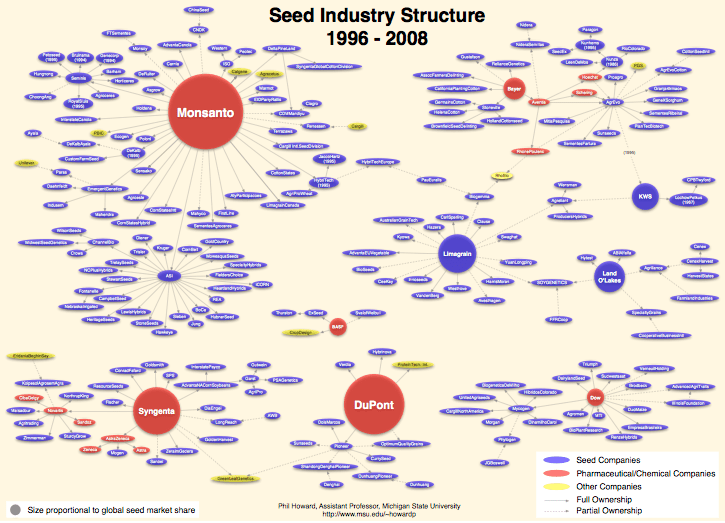 Corn and soy breeding and seed sales are now controlled by just a few companies, and these companies now create huge corporate political interference when reforms are suggested. In the article cited at the top of the post, Jeffrey Sachs warns that these companies might just have the power to lobby themselves out of business. What are the results of growing all this corn and soy in terms of public health, the environment, economic vitality and peace and security? The health and medical communities are dismayed by the poor diets in America, especially among the poor, who predominantly eat highly processed foods. Something like half of all minority children are expected to suffer from diabetes. And obesity is a slow motion national health catastrophe that is straining our already broken economy. The pollution is tremendous: greenhouse gases, pesticide runoff, soil erosion, terrible air quality, antibiotic contamination, etc. Results can be seen from space as a dead zone develops each summer in the Gulf of Mexico, as the waters of the Mississippi River overwhelm even the absorption capacity of the ocean. Farmers are not generally getting rich growing cheap commodity crops. A lot of money was made by some during the 2008 commodity boom, but input costs also rose sharply. We see over the long-term that many rural communities across the country suffer from depopulation and an aging demographic profile, and food policies have contributed to these trends. Many sensational and heartbreaking news reports during 2008 discussed how rising food prices and a weakening economy were causing hunger and political instability around the world. Oddly, a number of the nations affected could grow plenty to feed themselves. But they weren’t because of development programs initiated by the World Bank, the International Montetary Fund, and the U.S. government. The gist of the story is that countries wanting aid money needed to orient their economies towards export and open their ports for import. As cheap U.S. grain flooded the world, local farmers producing the essentials went out of business, and large agribusinesses were able to move in and produce the kinds of crops wanted in the wealthier world. This seemed to work fine until prices of the commodities imported rose, and the local currencies dropped in value. Reduce subsidies for crops used mostly as animal feed, i.e., corn and soy. Ensure carbon price reflect full costs to drive land use towards pasture systems and make long-distance trucking more expensive. Increase funding for conservation reserve programs and habitat restoration on farmland. Fund research and outreach into low-input farming systems, including public domain seeds. Support wellness and acute health care for all citizens. The logic behind these recommendations is as follows. Crop subsidies create an oversupply of corn and soy that drive down prices and enable unhealthy practices to persist, including feedlots and the kinds of processed foods leading to obesity and diabetes. By removing those subsidies and instead allowing farmers to earn credit for soil carbon sequestration, environmental gains will start to appear as land is placed into healthier rotation schedules, including pasture. A price on carbon would also make distance more expensive and local more affordable by comparison. To wean ourselves off of oil dependency and increase food security, locally produced foods need to steadily gain market share. Greater funding of existing programs that discourage the use of marginal lands and encourage the creation of natural habitats, such as riparian buffers, would support an agroecological approach that reduces dependencies on pesticides and other inputs. Farmers that have been on the chemical cycle for decades will need information, living examples in their area, and new sources of products including non-patented seeds. The programs to make these changes already exist but need expansion, such as SARE, ATTRA, NRCS, other non-profit groups, and regional university and USDA extension offices. And finally, one of the lessons we can draw from the farmer suicides in India is that the lack of a safety net can push people over the edge. By contrast, if we ask farmers to take a risk and change what they are doing, it behooves us to put a health care system in place for them and their family so they are less afraid to let go of the familiar. From the food eater perspective, reduced subsidies may mean higher food prices, but these could be handled by lowering health care costs. U.S. families tend to spend only 10% of their income on food, which is the lowest of any nation in the world. By contrast, we spend more on health care than any nation, which is partly due to spending so little on subsidized food. My current work is to establish agroecological farming systems that link into healthy local food systems. I see the liabilities of what exist now and know that our nation is literally and figuratively hungry for change. I was just reading an article in The New York Times by Michael Pollen [sic] about food and the fact that our entire agricultural system is built on cheap oil. As a consequence, our agriculture sector actually is contributing more greenhouse gases than our transportation sector. And in the mean time, it’s creating monocultures that are vulnerable to national security threats, are now vulnerable to sky-high food prices or crashes in food prices, huge swings in commodity prices, and are partly responsible for the explosion in our healthcare costs because they’re contributing to type 2 diabetes, stroke and heart disease, obesity, all the things that are driving our huge explosion in healthcare costs. Books, blogs, and articles about local foods have been popping up with high frequency recently. I am not going to get into who’s involved or even what they are discussing in any detail, but instead refer readers here, here, and here for background. Or if you want to stick to The Oil Drum, similar discussions occurred here a couple years ago. I am going to make an argument I don’t see much. Reading the pros and cons on this subject is a bit like watching a pea roll around on a plate. My goal is to stick a fork in that pea and focus on something very fundamental. The point I will make is that one can say with high confidence bordering on certainty that only a predominantly local food system will ever be sustainable. What I mean by sustainable is the ability to endure. Quite simply and irrefutably I conclude that the current globalized food system is a flash in the frying pan because it doesn’t respect the first law of thermodynamics. Whatever other argument you might want to make against the global and for the local (and several legitimate ones come to mind) this fatal flaw is insurmountable. No quibbles, qualification or value judgments need to get in the way of this basic fact. The first law of thermodynamics is that matter and energy are never created nor destroyed, they only change form. The forms of matter and energy in the human body come from food, which primarily comes from soils. When plants and fungi occupy soil and grow, they ingest atoms in simple or mineralized forms and incorporate them into organic forms. This process essentially mines soils at an atomic scale. The concentration of people into urban centers requires shipment of food far away from agricultural lands. Soils, therefore, are constantly depleted of nutrients. Currently, these nutrients are replaced by adding soil amendments and fertilizers that themselves derive from mining operations. In the same way that oil fields deplete, so do the mines that support current agricultural practices, whether based on man-made chemicals or imported organics, such as bat guano from Chile. In essence, the food system is predominantly a linear chain from mine to soil to food to plate to bodies and excretions to the treatment plants to the water ways and land fills and to the oceans. Fig. 1. The linear flow of minerals from mines to farms and then dense human settlements leads to depletion at one end, and the concentration of wastes or dispersion into water at the other. Graphic from Folke Günther. Because we can’t create matter out of thin air to replace these depleting resources (First Law) the system is unsustainable. To make it potentially sustainable we’d have to take the waste outputs and make them inputs again to yield a cyclical food system. A sustainable system must be primarily local because of energetic and logistical constraints. What is removed from a plot of land needs to be returned. Okay, not the exact atoms, but roughly the same kinds atoms in the original quantities and proportions. This line of thinking has led me to a very important question: What is the average mineral composition of human urine and feces? My search has not been exhaustive, but I did come across two fairly recent publications that both reference a 1956 study by the World Health Organization. One of these, The Humanure Handbook is available online or in many bookstores. The other is a booklet published by Ecology Action titled affirmatively, “Future Fertility: Transforming Human Waste in Human Wealth.” Here’s a table from those sources, which are really one. Table. 1. Mineral composition of human waste in pounds per year. A classic composting method is to combine animal manure and urine with mature crop residues, usually straw. When mixed appropriately, this combination has an ideal ratio of carbon to nitrogen (C:N) leading to the formation of quality finished compost. Straw also includes various transformed soil nutrients, so the final product is nearly a perfectly balanced source of soil replenishment, which is what you’d expect given the First Law. Let’s put our mind in the toilet for a moment. What is going to be the best strategy for taking the contents of that porcelain bowl and mixing them with straw? Should the straw be brought to every home? Should it go to the municipal treatment plant? Or perhaps the straw should stay on the farm with the “precious cargo” shipped from city to country? Fig. 2. Some of Fido’s best ideas arise during moments like this. Right now he is thinking about all the plastic baggies that pick up his “deposits” in the neighborhood. Shouldn’t that stuff get back to the farm, somehow? Would life be better as a county dog? These questions may amuse and be largely ignored, but they are completely fundamental. One of the few people I know of who studies this issue is the systems ecologist, Folke Günther. His website provides more up to date calculations for human waste, and he even uses the metric system! To simplify the subject a bit, he focuses on phosphorus. The reasoning is straightforward–it is ten times more concentrated in the human body than in the Earth’s crust and therefore the most limiting nutrient in most locations. Essentially, if phosphorus can be reclaimed effectively so can everything else. Fig. 3. Günther’s model of the phosphorus cycle in a balanced agricultural system with exports of food being returned to the land in the form of processed human waste. In Günther’s writings and presentations on the requirements for sustainable cycling of nutrients, he suggests that the population of rural areas needs to be about twelve times larger than urban areas. He gives a scenario where ruralisation occurs in a region over 50 years based on the normal turnover rate of infrastructure—essentially as urban centers decay they are not rebuilt and investments in housing and other infrastructure are made instead in the adjacent hinterlands. Furthermore, assuming a rise in transportation costs, he also shows that a rural economy based on local food and energy weathers oil depletion well, in contrast to a city that must import basic needs. I find these concepts obvious. I think a child can understand the basic premise operating here: If you take and don’t give back, it runs out. The implications, on the other hand, are stunning. Will the migration to the cities, a demographic phenomenon that has gone on for so many decades, be necessarily reversed in the 21st century? If so, is it even remotely possible that this might happen in a thoughtful way as envisioned by Günther? And of course ruralisation in a region like Las Vegas is impossible. This topic has not gone unexplored on The Oil Drum. Phil Harris described the essentially local and long-term persistence of agrarian village ecosystems, especially in China. I have heard stories about farmers in China competing for humanure by building comfortable and decorative outhouses along roadside borders of their land. Please send pictures of these if you come across any of them. I am looking for some design ideas for the future.